Welcome to Part 2 of my post on The Writing Life. Last time I spelled out the many ways bloggers and freelance writers get distracted from their main task of blogging and earning a living by writing. I also talked about the balance between giving writing away and being paid to write. Now I’m going to look at how I spend my days and where the time goes. Back in December, I purchased a handy little app called Office Time. Let’s talk about my categories. 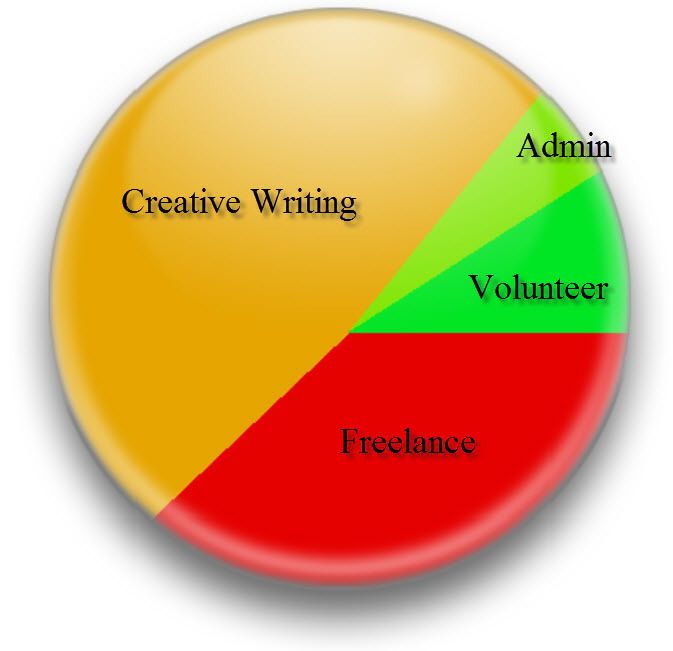 Freelance Writing is all the paid writing work for others – in other words, billable hours. The 44% (47 hours) shown here is unusually high compared to the rest of the year and I’ll talk more about that later. Volunteer Work is all the unpaid writing and editing work I do for others. Admin is administrative work related to my own writing and blogging. Creative Writing is the writing I do for myself — blog posts, essays, articles, book and the research and marketing associated with that. Unlike Freelance, this is work I write first, then pitch or submit. 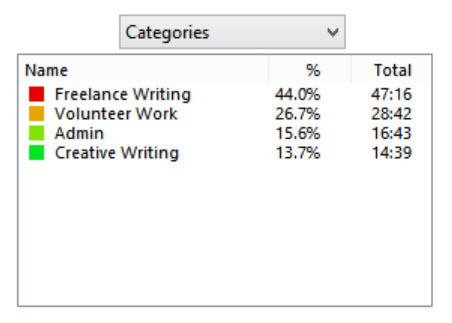 Now that I look at the categories, I think I should separate out marketing (submissions, pitches, proposals, looking for publishers, etc) to keep the creative writing category cleanly focused on just that. But for now, this works. Things that are not captured include “away from desk” activities (attending meetings, conferences, continuing ed, networking), online socializing (email, Twitter), surfing the web and the rest of life that endlessly demands attention. That’s typical of my year, though my Writing Group is normally a bit bigger (we take December off) and Friends & Family a bit smaller. This took up 8 hours in December, the equivalent of two blog posts. But I believe friends and family should support each other. It’s no different than being the auto mechanic of the family or the computer expert or the person who can find the best deal on a used piano. You do things for each other. Writing Group: I’ve broken my writing group out from the other groups I volunteer for because this group directly serves my writing and continuing education. Made up of professional writers and authors, we meet every 2 weeks solely to critique one or two works in progress. 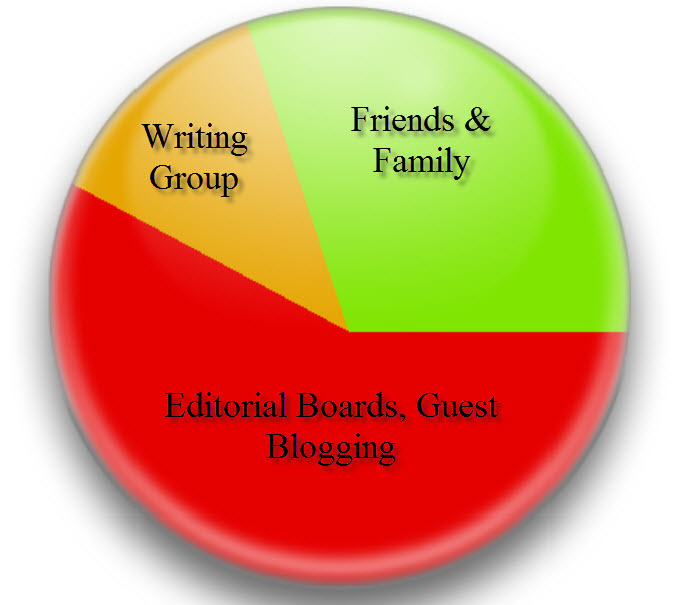 I give this group 8-10 hours a month in meetings (not reflected in the pie chart), reading and writing critiques of other people’s work, and some administration. What I get in return is in-depth critiques of my own writing, an expectation that I produce work regularly, the breadth of knowledge that 8 seasoned writers from various genres bring to the table and an invaluable support group. Editorial Boards, Guest Blogs: Here’s the big chunk. Last year was the year of reaching out. I stepped up and joined the founding editorial team of Science Borealis – a job that now entails roles on three different teams, a raft of daily duties, a regular editorial blog post, and 3-4 meetings (via phone or G+) each month — altogether, 16.5 hours in December. I also began regularly blogging for Canadian Science Writers Association (CSWA) and contributed a number of other guest blogs to other sites. Sometimes you just need time to work on your own stuff. So it seems obvious that a dramatic cut here is necessary. But this is where I return to that large piece of pie in the first graph – Freelance Work. Until August 2013, I had not been paid for any of my writing. Then, out of the blue, I got the call from Ontario Science Centre asking if I was interested in a full-time 3-month writing contract. I took the contract and was paid a decent government salary to go to work every day and write science for them. It was a dream-gig. While there I made connections that directly resulted in two more freelance jobs — more than 60 hours of paid work! So why did the Science Centre call me? They said they found me through CSWA, read my work there, and checked out my blog. They asked if I had been published and I pointed them to The Best Science Writing Online 2012. They asked if I had experience working with teams and I pointed to Science Borealis. They asked for references and I gave them my writing group members. What do the rest of you writers think your pie looks like? Do you have overbearing sections that need trimming? Are you getting paid or recognized for most of your time? Do you spend enough time developing your own work or is it all for other people? What shifting around are you going to do in 2014? I can assure you, here there will be changes. You and me both. I’ve got to get more balance and more time for creative writing too. One of my problems is priorities. I really need to answer the “what do I want” for myself first. The secret of finding more time for “creative” writing (in my book, all writing is creative, it just serves different purposes) — anyway: the secret is a round device that looks very similar to your pie charts showing time breakdown. This round device, is called a TOIT, pronounced as two words — to, it — is hard to find. When you actually do locate it, and marvel at is ’roundness’ your problems will be solved. Or to state it briefly: you’ll have time to write creatively when you get a Round Toit. It’s the perennial question of figuring out what level of volunteer engagement is good for maintaining contacts, networks, and making new connections, and at what level of engagement you reach the point of diminishing returns (or even negative returns given the impacts on your own writing). I just read this post (http://tenureshewrote.wordpress.com/2014/01/09/always-rushing-never-celebrating/) that – though it’s from an academic perspective – covers points relevant to your post. 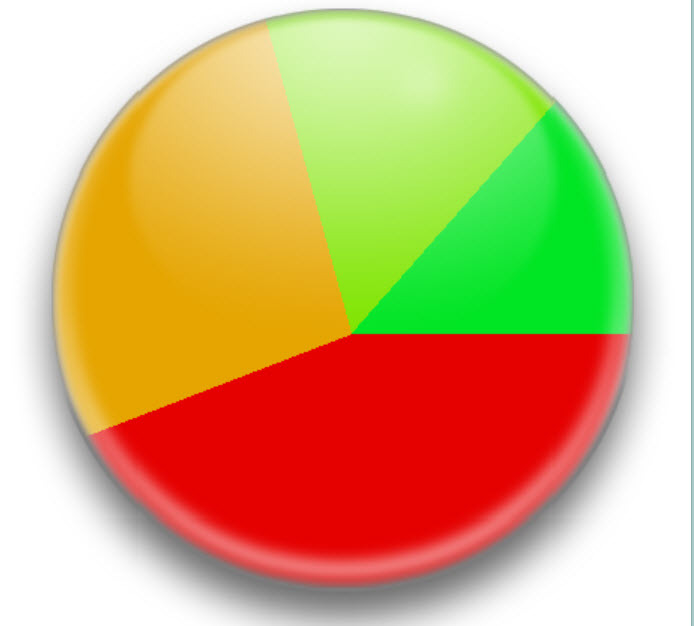 Mostly about resolving to be ‘busy’ with things that meet your own goals (I’m so impressed that you know what you want your pie chart to look like – still working on that myself…). Bill, you’re right. Sometimes the hardest thing is just getting around to it. The pie you do not see here is the one that shows the slice of time spent on Writing (all of the activities mentioned in my post) vs the slice spent on The Rest of Life — which is what I think you are getting at, Gwynn. That’s the one that really has to be prioritized and brought under control. People with full-time jobs (other than writing) find it impossible to squeeze in time for creative work. And those of us who work from home find it hard to resist all the other distractions and obligations around us. There is always a dishwasher to be emptied, an errand to run. Sarah, I agree Sci Bor & CSWA are beneficial. And plus, I really like the people! I think the balance is going to come down to finding a better system for handling those obligations. Impressive and extremely useful! I’m actually not surprised that it was you who wrote this blog post because of your science background, organizational abilities, etc. Still, it’s so impressive! Think I’ll forward it on to my writing group!! Happy New Year!